As from today, 29 November, all four container terminals at the port of Hamburg implement a time slot-booking system for trucks collecting or delivering containers, informs the port’s press service. 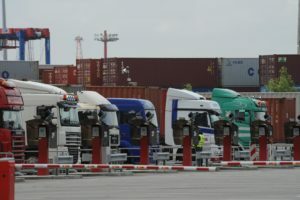 With this initiative, Hamburg becomes the first German seaport to introduce such a system to optimize truck handling and avoid bottlenecks at the port. Now all haulage companies coming to HHLA Container Terminals Burchardkai, Altenwerder, Tollerort and Eurogate Container Terminal Hamburg to deliver or collect a container must agree a time window beforehand. The trucking planners will request the required transport time via an EDI interface or slot-booking website to the relevant terminal. If there is enough capacity at the given time, the 60-minute slot can be booked. When a truck arrives at the terminal, the arrival time is compared with the booked slot. If the truck arrives on time, i.e. within its time slot +/–30 minutes’ leeway, the transport is processed as scheduled. If the driver misses this slot (arrives 60 minutes earlier or later) then he is handled with lower priority, provided there is capacity at the terminal. If the agreed time window cannot be adhered to, the visit must be rebooked before the truck arrives. Hamburg’s slot-booking system is structured so as to offer truckers the highest possible flexibility. Slot cancellations, re-bookings or exchanges and additional bookings are possible by agreement with the terminal. However, HHLA, for instance, warns that booking visits at the terminal is not possible, nor can trucks wait in the terminal parking area. Port of Hamburg comments that due to increasing vessels size, more and more large containerships with capacities of over 20,000 TEU call at the port, which means that in one ship call up to 14,500 TEU can be handled. This leads to container transport peaks to, from and around the port. The new slot-booking system should relieve these peaks and spread the truck handling evenly, as well as increase the terminals’ capacity by more optimal use of resources. It will also offer the haulage companies standardized processes and information exchange at all container terminals and will help reduce their waiting time. All in all, the time slot-booking system facilitates transparency and makes planning easier for all those involved in the Port of Hamburg.